We specialise in Moorcroft, Clarice Cliff, Royal Doulton and Poole ceramics, as well as small pieces of furniture. We have over the last 25 years gained a great deal of knowledge of the areas that we specialise in. Photographs and details of some of our past and present pieces are included in editions of the book, "Millers Collectables Price Guide". 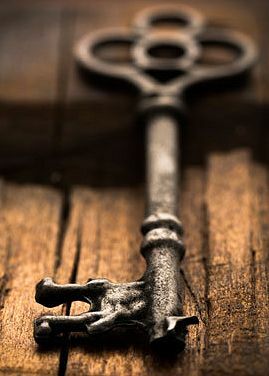 We believe in selling quality items, and also selling them at a fair price. If you are looking for a particular piece of Clarice Cliff, Moorcroft, Royal Doulton, Poole or other ceramic pieces, and you do not see it displayed here please let us know and we will try to obtain it for you. New items have been added to the web site. Some of these new items are shown below. The other new items are on the other pages for you to view. 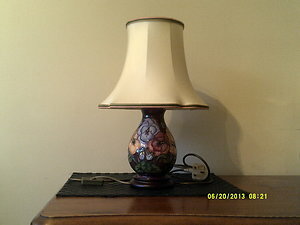 A Moorcroft Lamp in the Pansy design 0n a brown background, with a wooden base and original lamp shade. Height of lamp base is 9 inches, and lamp shade is 9 inches high. In very good condition. Price: 110 Pounds Sterling, (plus post & packing). A Clarice Cliff "Autumn Crocus" tea/side plate. The back stamp in gold on the base of the plate is 'Royal Staffordshire, Crocus, by Clarice Cliff, MADE IN ENGLAND'. Also there is a back stamp in black on the base which is 'Royal Staffordshire Ceramics, MADE IN ENGLAND'. The plate is 6.5" in diameter, and is in very good condition with no marks. Price: 55 Pounds Sterling, (plus post & packaging). 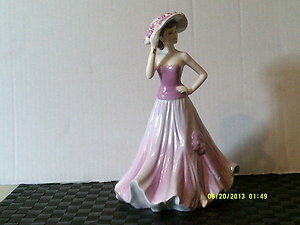 This is the Coalport figurine Diamond from the Gem collection. It is a limited edition of 1500 and this one is number 1001. The back stamp on the base is "Coalport Crown backstamp; COALPORT EST. 1750; The Gem Collection; Diamond No. 1001; In a Limited Edition of 1500; HAND DECORATED MODELLED BY Jack Glynn; BONE CHINA MADE IN ENGLAND; COALPORT 2003". She measures 9 inches high, with a diameter of 8 inches. The figurine is in excellent condition with no chips cracks or crazing. Price: 75 Pounds Sterling, (plus post & packing). Royal Doulton figurine "Amy" HN 3316 which was figure of the year during 1991, with this special edition only issued during 1991. Designed by Peter A Gee, with blue & rose colour. The back stamp on the base is "Royal Doulton Stamp; HAND MADE & HAND DECORATED; FIGURE OF THE YEAR AMY; HN 3316; This special edition will only be available during the year 1991; Modelled by Peter A Gee; 1990 ROYAL DOULTON." She measures 9.5 inches in height, and the diameter is 4.25 inches. The figurine is in excellent condition with no chips cracks or crazing. Price: 150 Pounds Sterling, (plus post & packing). Carol is Coalport's Ladies of Fashion figurine year for 2003. 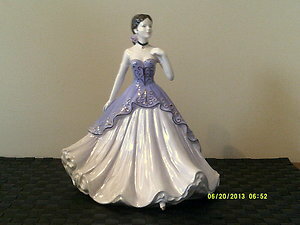 It has a flowing lilac gown with a lustre finish. The back stamp on the base is: "Coalport Crown; COALPORT EST. 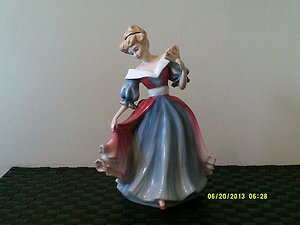 1750; Ladies of Fashion; Carol; FIGURINE OF THE YEAR 2003; No. 4,610; IN A LIMITED EDITION OF 5,000; HAND DECORATED; MODELLED BY Jack Glynn; BONE CHINA MADE IN ENGLAND; COALPORT 2002". The Height of Carol is 9 inches, and the Diameter is 6 inches. The figurine is in perfect condition. Price: 115 Pounds Sterling, (plus post & packing). 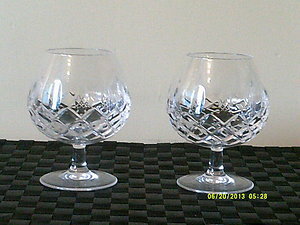 A pair of cut glass Brandy glasses. The pair of glasses are in excellent condition. Price: 30 Pounds Sterling, (plus post & packing). 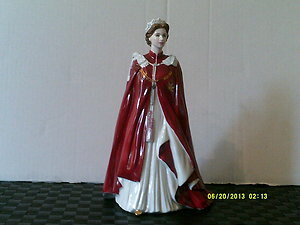 A Royal Worcester figure of Queen Elizabeth the second dressed in the robes of the Order of the British Empire. The back stamp on the base of the figure is "A Crown; BY APPOINTMENT OF HER MAJESTY QUEEN Elizabeth II; MANUFACTURER OF CHINA & PORCELAIN; THE WORCESTER ROYAL PORCELAIN COMPANY; WORCESTER; ROYAL WORCESTER; ESTABLISHED 1751; 2006; INE CHINA; IN CELEBRATION OF THE QUEEN'S 80th BIRTHDAY 2006; Dressed in the Robes of the Order of the British Empire". The height of the figure is 9 inches, and the Diameter is 5.75 inches. In excellent condition. Price: 80 Pounds Sterling, (plus post & packing). 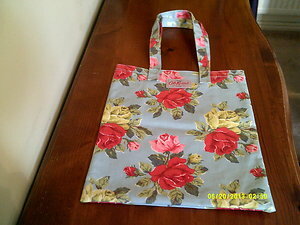 A Cath Kidson grey Canvas Tote/Shopper Bag in the Antique Rose pattern in pinks and greens. It has an open top with one inner pocket, and two straps. Size is 14.5 inches by 12.75 inches. In excellent condition. Price: 12 Pounds Sterling, (plus post & packing). 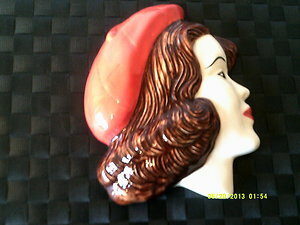 An Art Deco Lady Wall Plaque produced by Moorland Pottery. Hand painted in the Stoke-on-Trent Potteries. Wearing a blue hat, blue jewellery and a pink flower in her hair. The back stamp on the back of the Wall Plaque is "Moorland; STAFFORDSHIRE; ENGLAND". The height is 6.5 inches, and width is 7 inches. In excellent condition. Price: 20 Pounds Sterling, (plus post & packing). 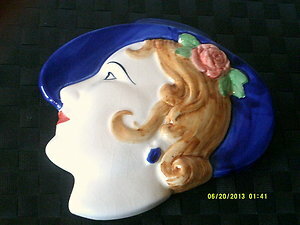 An Art Deco Lady Wall Plaque produced by Moorland Pottery. Wearing a red hat. Hand painted. The back stamp on the back of the Wall Plaque is "Moorland; CHELSEA WORKS; BURSLEM". The height is 6 inches, and width is 5 inches. In excellent condition. A framed, coloured reproduction of a John Speed map of Devon as it used to be around 1610. 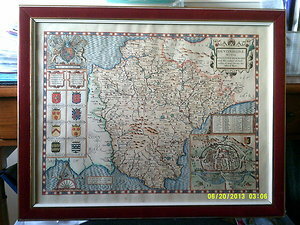 The reproduced map is framed within a Burgundy coloured frame. Along the left hand side of the map are the arms of "Families dignified with the title of Devonshire and Excester", and just above them are the Royal coat of arms. In the bottom right hand corner, a birds eye view of Exeter is depicted, with all it's streets, churches and important buildings portrayed in detail. Dartmoor is shown on the map, as well as all of Devon's villages, estates, rivers, woods and other major landmarks. John Speed was the most famous of all English map-makers. He published an atlas of the counties of Britain, entitled "The Theatre of the Empire of Great Britaine", in 1611. It has been printed to retain the look of the original paper, and reproduced onto quality cream vellum. The size of the framed, coloured, reproduced map is 19.5 inches in height and 24 inches wide. In excellent condition. 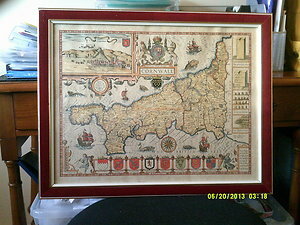 A framed coloured reproduction of a John Speed map of Cornwall as it used to be around 1610. The reproduced map is framed within a Burgundy coloured frame. In the top left hand corner of the reproduction is a view of Launceston, showing the old town walls, castle, priory and prison. Eleven coats of arms are illustrated on this map with the armorial devices of the Earls and Dukes of Cornwall running along the bottom, together with the Royal coats of arms at the top of the map. Running along the right hand side of the map are drawings of "The Hurlers", an ancient stone circle, and "The Chesewring". The map also has monsters in "The British See", and the ancient sites such as St Michaels Mount and Tintagel Castle. John Speed was the most famous of all English map-makers. He published an atlas of the counties of Britain, entitled "The Theatre of the Empire of Great Britaine", in 1611. It has been printed to retain the look of the original paper, and reproduced onto quality cream vellum. The size of the framed, coloured, reproduced map is 19.5 inches in height and 24 inches wide. In excellent condition. 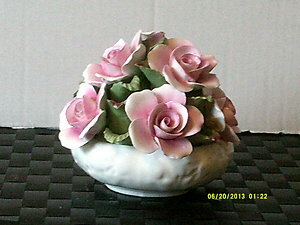 An Aynsley Porcelain Encrusted Rose Bowl, with pink roses in fine bone china. It is 4 inches in height, and a diameter of 4 inches. In excellent condition.